Was riding home on the Stella Friday and it suddenly started running a bit off. 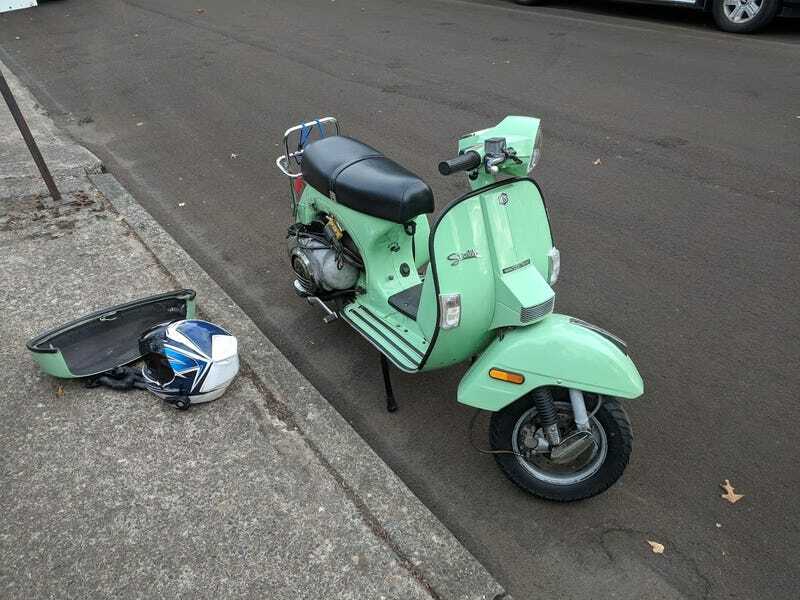 About a half mile down the road from there it seized up completely resulting in a pretty sketchy rear wheel lockup at around 50mph. I was able to clutch in quickly and keep the bike upright, but nothing I could do on the side of the road would get the motor to turn over. Fully cooled down everything was still completely locked up. The piston has similar damage and what appears to be a needle bearing embedded. It appears something in the bottom end gave up and proceeded to quickly grenade the rest of the motor. I’ll update more once I figure out how to tear the motor down further, right now it’s seized at TDC and I can’t split the case with the jug still on. Thankfully, worst case scenario, I can get a fresh complete motor for about $600 if nothing in this one is worth salvaging. Tore in a little further tonight. Got the motor out of the bike. Got the exhaust off and that allowed me to beat the jug off with a hammer. The piston has DEEP scouring, not going to be good for much other than a neat desk toy. The cylinder fared a bit better, being made of a noticeably harder metal. Still cylinders are cheap enough to make reworking this one not worthwhile. Everything inside is coated with fine copper flakes. The crank is totally seized at the big end. I tried everything I have on hand to free it up but noting. This is the failure point. Reading online, there was a tolerancing issue on a bunch of these that causes the bottom end to go. It appears that’s what happened here. And that’s where I’ll be for a while. Next step is to split the case, but I’m waiting on a flywheel puller to get any further.